Then comes the shining brass tray, bearing Syrian brandy, insidious fig paste (of which one always eats too much), pistache nuts, never to be forgotten Turkish coffee, and the bishop's own cigarettes, stamped in gold Syrian letters with the text: "This is the day the Lord hath made. We will rejoice and be glad in it." 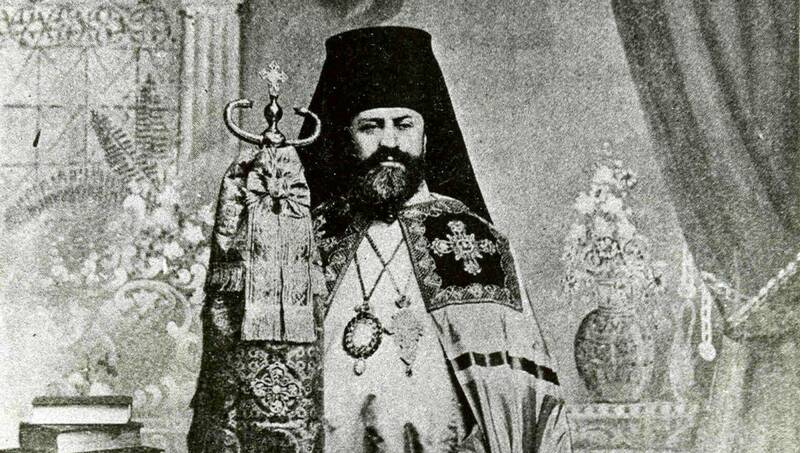 Bishop Raphael Hawaweeny was the first Syrian member of the Orthodox Russian clergy to receive full episcopal honors in this country. From the outset he was successful in his efforts, and in recognition of his effective missionary work here he received the higher church honors at the hands of the synod and Czar Nicholas. THE WASHINGTON POST — Washington D.C.
Special Correspondence of The Washington Post. — New York, July 28. "WHAT an enchanting vase!" said a buyer in an uptown bric-a-brac shop, as she paused before an enameled copper jar of simple, artistic shape. "Syrian; $15," explained the accomodating salesman." "Come away," murmered the friend. "I will show you where you can buy the same thing for half the price; and rugs and embroideries and brasses and—"
The initiated one led the would-be buyer to a most inartistic and unromantic quarter in the lower part of the city—no section of New York could seem less likely to reveal mysteries of the Orient; yet, under the guidance of one who knows, it yields treasures. Enter a dismal little room perhaps 10 by 12 feet, and you see only rows of shelves filled with folded cloth. Ask to see embroideries, and the gorgeousness of the East is unrolled before you. Sometimes you may name your own price, sometimes not. The Syrian is canny, and it is up to the buyer to be his own judge of values; but in every case an American merchant would charge more for the same thing. Much has been published regarding the Syrians in New York which they resent as inaccurate and unjust. They say that they have often been misunderstood, or, worse yet, willfully misrepresented, in order to make a picturesque or sensational story. "The Syrians who have come to America to live have one chief object—to become good American citizens." This is, in effect, the declaration of every Syrian, high or low, rich or poor, who is questioned as to his life in America. There are about 70,000 Syrians in the United States and Canada and 6,000 in and around New York. The pioneer Syrians were regarded by Americans with deep distrust, and some of that feeling remains to this day. Poverty forced the humbler ones who wished to live in New York into an undesirable quarter of the city—Washington, Carlisle, Rector streets, West Broadway and vicinity, and the poorer parts of Brooklyn and Jersey City. Even now, when there are many Syrians here who can well afford good apartments and houses, the prejudice is so strong that landlords in the better districts refuse to accept them as tenants. The Syrians are the product of tyranny in their own country, and it has developed at least an outward patience and gentleness. It has also developed a passionate appreciation of the freedom of America, but, unlike many races who thirst for freedom, the Syrians do not abuse it. They are pre-eminently law abiding. It is true they are shrewd and subtle. They put up a barrier of reserve which is not to be crossed. They seem always cautious and on guard. This, also, is the result of the tyranny, injustice, and suspicion which have been accorded them. It is easy to realize that they might be capable of driving a better bargain than an Anglo-Saxon. "It is the way we have been governed in our own country that makes us smart," said one—a university man, master of seven languages, editor of Meraat-el-Gharb, one of the Syrian newspapers published in New York. "We must learn everything we can, especially languages, for a Syrian never knows where he may have to make his home. He must be wise and guard each word he speaks, for he never knows to whose ears it may go or what use may be made of it against him." They sell their goods at reasonable, often amazingly low, prices, and invariably for less than an American importer would charge for the same article. The New Yorker who has learned what treasures may be found in the Syrian quarter never fails to betake himself down there before the Christmas holidays. There, in a dingy little room that would not serve an American merchant for a waste paper closet, are piled Oriental fabrics, embroideries, rugs, brasses, coppers, laces, and carved wood. The bazaar method of arranging his wares stands the Syrian merchant in good stead in the close quarters to which he has thus far been condemned in New York. Religiously the Syrians are of many minds. The greater number in this country belong to the Greek Orthodox Church. There are Maronites, some Roman Catholics, a sprinkling of Presbyterians, and about one Mohammedan in two hundred. The Presbyterians and the Roman Catholics are the product of missionary work in Syria. The Greek Orthodox Syrian regards the missionaries with amused disdain. "Why should you send missionaries to us, who live in the land where Jesus walked and were Christians before America was dreamed of?" The principal church of the Greek Orthodox Syrians is in Brooklyn, and at their head is Bishop Raphael Hawaweeny, who is a native of Damascus and is now a most zealous worker for his people. He was the first Syrian member of the Orthodox Russian clergy to receive full episcopal honors in this country. Nine years ago he came to the United States as an emissary of the Greek Church to carry on religious work among the Syrians of New York. He was then an Archimandrite. From the outset he was successful in his efforts, and in recognition of his effective missionary work here he received the higher church honors nearly two years ago at the hands of the synod and Czar Nicholas. It is a habit of the bishop's flock, especially the men, to call on him Sunday afternoon. Then he adds to the patient, fatherly care of his people the kindnesses of an extremely clever host. In his home the bishop wears a robe of heavy, lustrous black satin, and is never without a string of agate beads in his hands. "Has it any similar religious significance?" "No; it is for ornament only. I like to handle it. I am not content without it." "They were give me by a member of my church the day I was ordained," the bishop explains. Across the street from the bishop's house is the Syrian Church. This belonged originally to a Protestant denomination, and has not the distinctive mosquelike construction of Russian churches. The interior is of the plainest, except that the altar approaches and furnishing gleam with the brilliant, barbaric colorings and gildings which are characteristic of the Syrians and which give a rich Oriental effect to the otherwise bare house of worship. A high, carved screen extends across one end of the church, before the altar. In the middle of this screen is the Holy Gate, a doorway to the altar. This cannot be entered except by the head of the Greek Church, or by the regularly ordained priests or higher prelates. A partition rises on either side of this gate, which is called an ikonostas, in which there are side entrances, where deacons and lower officials may enter. Standing in the Holy Gate, in his gorgeous satin robes, Bishop Raphael is an impressive figure. The home life of the Syrians is extremely simple, whether they be rich or poor, and its chief characteristic is hospitality. There seems a childlike absence of system, and but one domestic rule—to offer the newly arrived guest refreshment. It may be only a whiff at a narghile, a cigarette, or a cup of coffee, but it is given with an abandon of generosity and a touching eagerness to please. Indeed, it is difficult to prevent a Syrian from showering you with gifts. You have the feeling that if he be not restrained he will give you the rugs from his floors and the bric-a-brac from his shelves. The Syrians in America, both men and women, dress in strictly American fashion. We would rather they did not, and we rejoice in the sight of an occasional fez or twisted scarf, worn especially at home, and gladdening our eyes with its Oriental grace. If you have a fad for lunching or dining in odd corners of New York you may some time drift into a Syrian restaurant. There, if your tastes be not strictly Oriental, you are advised to confine yourself to the black coffee. Around a little table a group of Syrians, each with a long, flexible tube attached to the water bottle of a narghile, become extremely convivial, and you may be reasonably certain they are discussing politics. You also observe that they are not at their best. They cast off the sleepy eyed reserve which they usually extend to strangers and which so well becomes them and show a tendency to be vociferous. It is, however, so genial and spontaneous that you yearn to put aside your cold Anglo-Saxon restraint and join in it. The Syrians, as a rule, send their children to the public schools and are enthusiastic over the educational opportunities they can have in America. The Presbyterian Syrians, however, prefer private schools, where their children receive instruction in the Presbyterian faith. There the big-eyed babies divide their solemn allegiance between Jesus Christ and George Washington and chant faithful little prayers in soft, minor strains. PREVIOUS: April 30, 1905 - Newspaper Claims Tsar Nicholas II is "Pope of the Greek Church"